Spitfires of the No. 352 (Yugoslav) Squadron RAF at Canne, Italy, are prepared before the unit’s first operational mission on August 18, 1944. At the Teheran Conference toward the end of 1943, the three powers decided to recognize the Yugoslav partisan army – NOVJ (Narodno Oslobodilacka Vojska Jugoslavije) as a member of the anti-Axis coalition. Several months later, British military aid to NOVJ resulted in the formation of the partisan Air Force with two squadrons, No. 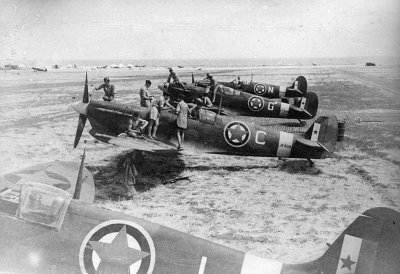 352 (Yugoslav) Squadron with Spitfires Mk. VC and No. 351 (Yugoslav) with Hurricane Mk. IV. The units were formed in North Africa in April 1944, initially trained on Harvards and later on Hurricanes . The RAF provided the training and the units were to remain under its operational command. Upon achieving combat readiness, No. 351 received eighteen used Spitfires Mk.Vc with tropical filters. The nearest aircraft in full view on the photo, “C” is serial no. JK608. The aircraft coded “G” is MH592. No. 352 was used for ground attack duties over the difficult Yugoslav terrain and unfortunately in short time suffered high losses, mostly to the German flak. Losses included one Squadron Leader, four Flight Lieutenants and almost a third of its pilots. My late father, Patrick McCarron was also a signaler but with the Royal Signals. He was based, I believe, at the headquarters in Bari. Later he went to the Island of Vis with some Commandos who were protecting some artillery sent to Tito's forces.